For the history buffs, top 20 monohull finishers 1978 – 2018 sorted by Elapsed Time. 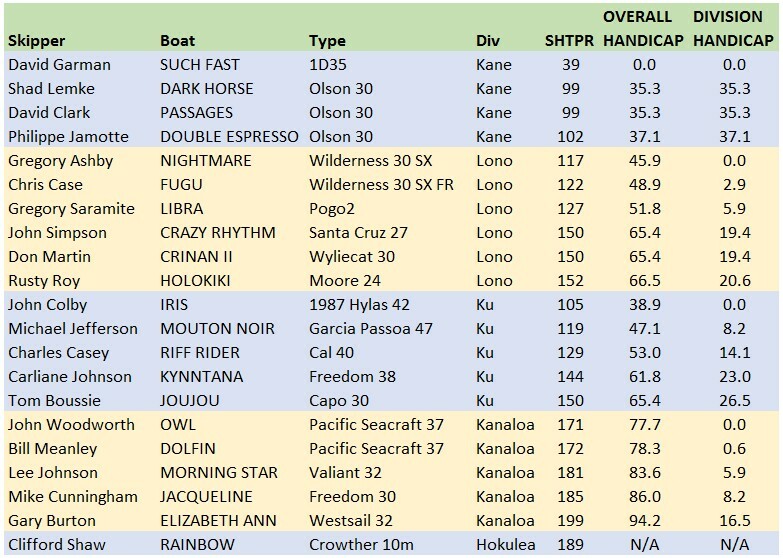 This year’s race was a fast one – there were four 2018 monohulls in the top 20 boats of all time – (based on finish time corrected for the boat’s PHRF rating). Results as posted to Jibeset. If you were planning to come out to the start, please note, to take better advantage of anticipated weather and current, RC has decided to move the start up one hour to 11:00 am. First warning will be at 10:55am 6/23 at Corinthian. Tell your friends and come out to support our 19 intrepid solo racers. See you there! Hi folks, you may buy your guest tickets here for the awards banquet in Nawiliwili, Kauai, Hawaii on July 14th. The menu promises to be something yummy. Choose “Pay with Debit or Credit Card” if you do not wish to log into a PayPal account. If your guest name is not obvious by your e-mail or paypal account, kindly send instructions to seller with the name that should be added to the guest list. Here’s the official entry list with division splits and the handicaps calculated in hours owed to the overall or fleet scratch boat. See also the posting on Jibeset. Purchase tickets by Tuesday, June 12. To pay with credit card, check out using “Pay without a PayPal account.” Guest names are needed, but apparently the link does not provide the opportunity to include notes. You may send an e-mail to treasurer@sfbaysss.org or feel free to contact if you have any questions.